Cookie Monster gets a taste of a mini Cookie cupcake at TCA. PBS Kids made a bunch of big, exciting announcements last week at TCA, aka the Television Critics Association Press Tour, in Pasadena. And, in addition to checking out their upcoming programming schedule (which is really cool -- more on that later! ), I also got to hang out for a bit with Cookie Monster. So adorable! 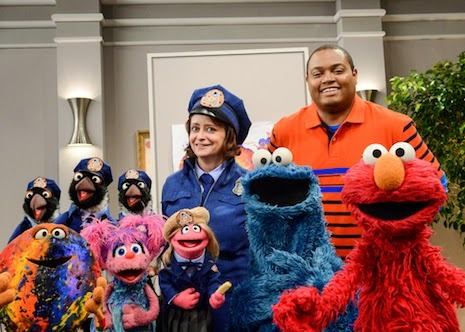 And speaking of Cookie Monster, PBS Kids and "Sesame Street" will air its first special centered on the furry blue cookie lover. In "The Cookie Thief," a one-hour episode airing on February 16, the Sesame Street residents are excited that a new cookie art museum has opened in the neighborhood. But when the art suddenly starts to disappear, guess who the main suspect is? Yes, Cookie Monster! Will the crew find the missing art in time, or will Cookie Monster be banished from the museum forever? "The Cookie Thief" will touch on concepts of self-regulation and impulse control, but in a fun way. 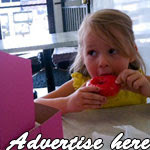 And let's just say that this parent could learn a little something about that, especially when it comes to donuts! Actress/mom Rachel Dratch, of "Saturday Night Live" fame, will also star. You can check out the preview and other fun stuff on PBS Kids' new YouTube channel: https://www.youtube.com/pbskids. 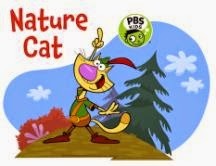 Also, this fall, PBS Kids will premiere a new series called "Nature Cat," an animated show that will teach kids about, well, nature. Designed for children ages 3-8, the show follows a house cat named Fred, who dreams of exploring the great outdoors. The series will encourage kids to make connections with the natural world. 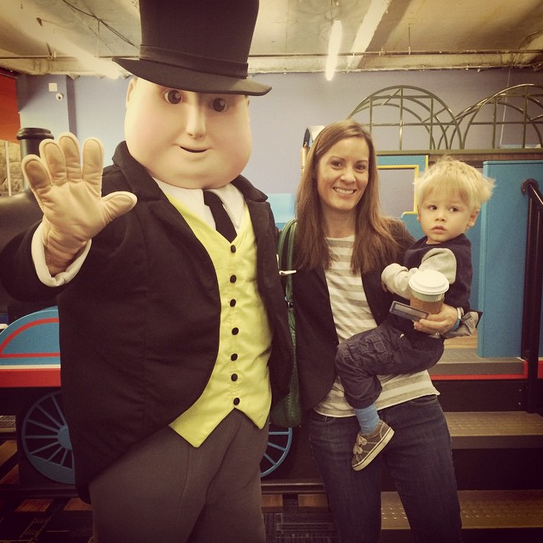 Will and I meet Sir Topham Hatt at the "Thomas & Friends" exhibit at Discovery Cube Los Angeles. 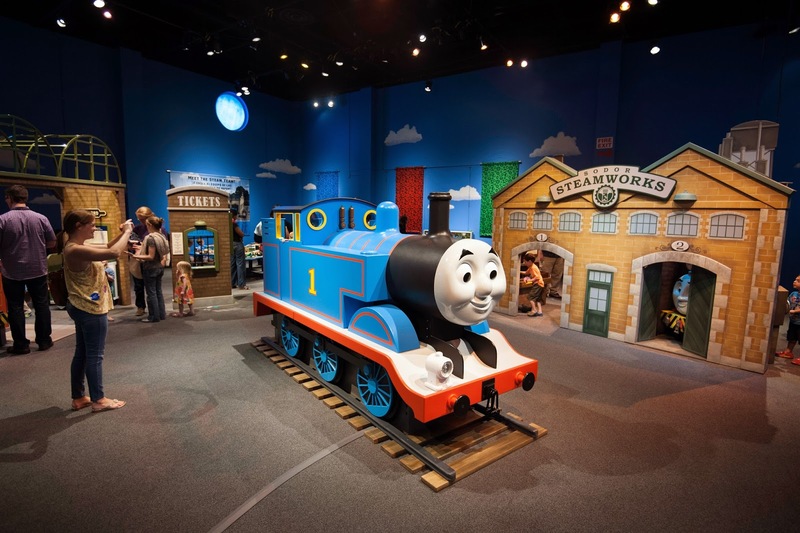 Thomas & Friends are pulling into a new station, as the super kid-friendly exhibit makes its way to Discovery Cube Los Angeles from now through April 26. Whether it's climbing into Thomas' cab, moving trains around various tracks, placing (rubber-foam) coal onto a conveyor belt, kids will have lots of fun interacting with this very hands-on part of the museum. 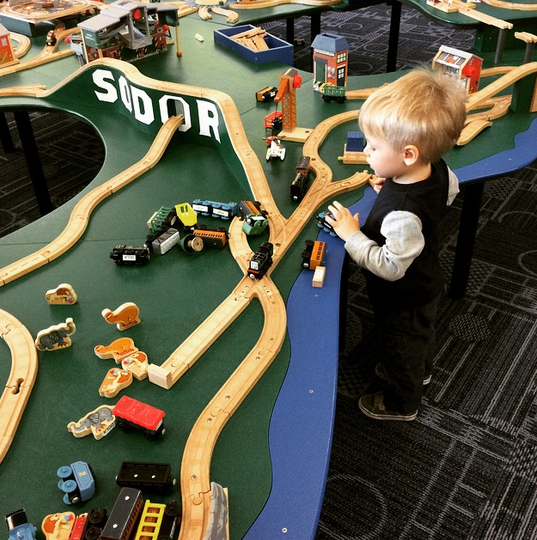 Will and I had the chance to check out "Thomas & Friends: Explore the Rails" at the relatively new Discovery Cube LA, and my little boy was in train heaven! He made a beeline for the train tables, which were just his size. Will plays with trains and pretends he's on the island of Sodor. He also loved climbing onto Thomas, sorting luggage and climbing onto pint-sized train cars. Discovery Cube LA staff was even on hand to help with crafts such as coloring and gluing shapes onto paper so kids could make their own trains. There was also a place for kids to sit, relax and watch clips from the show, and for parents to learn a little bit more of Thomas' origins. Will helps load coal for Percy's engine. You might remember our trip down to Discovery Cube Orange County for that "Thomas & Friends" exhibit. This one is the same -- or very similar. It's just at a new location, which is great because it means Will has more opportunities to hang with his favorite tank engine. 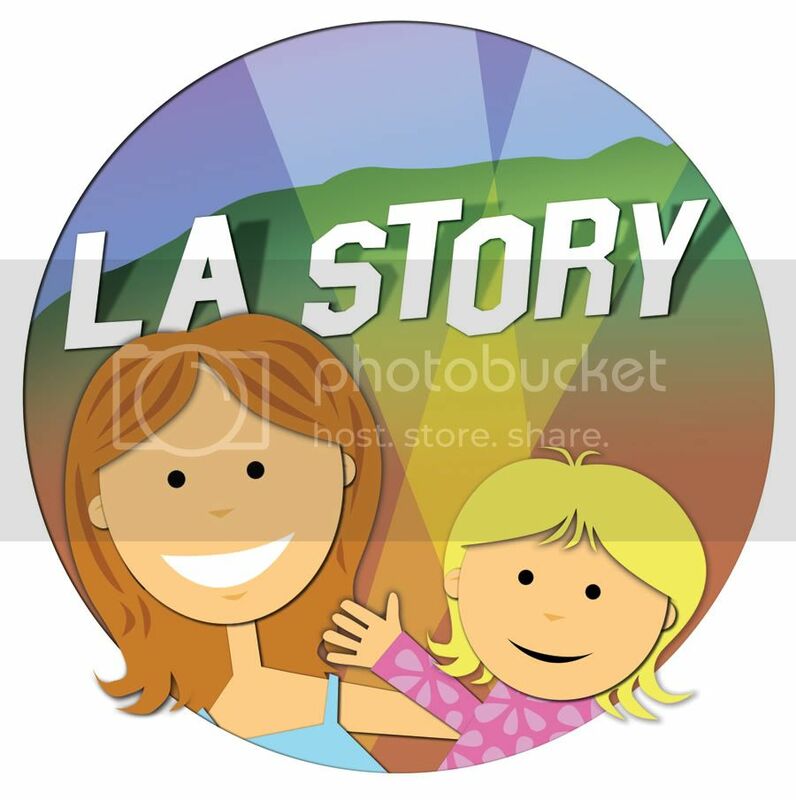 Also, I'm eager to check out Discovery Cube LA. The museum opened in November 2014 in the Hansen Dam Recreational Area of the San Fernando Valley. 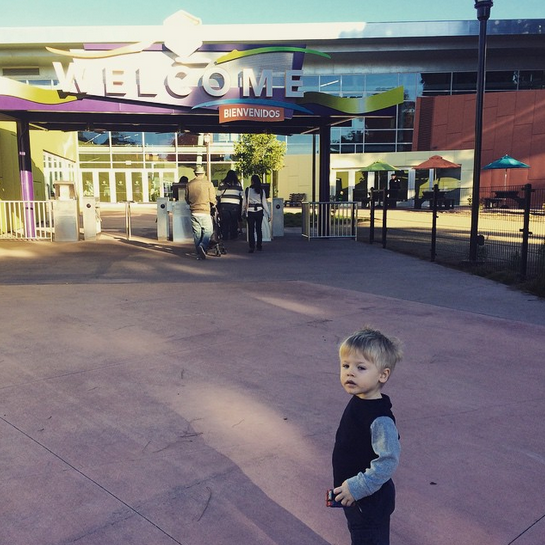 It's huge, with more than 71,000 square feet of interactive, science-based exhibits. It promotes STEM proficiency and early learning. About to head into the Discovery Cube LA. In fact, I can't wait to take CC so she can see the museum for herself. She really enjoyed the OC version and has asked and asked ... and asked(!) ... to go back. In honor of Martin Luther King Jr. Day today, the Los Angeles County Museum of Art -- aka LACMA -- is offering visitors free admission. 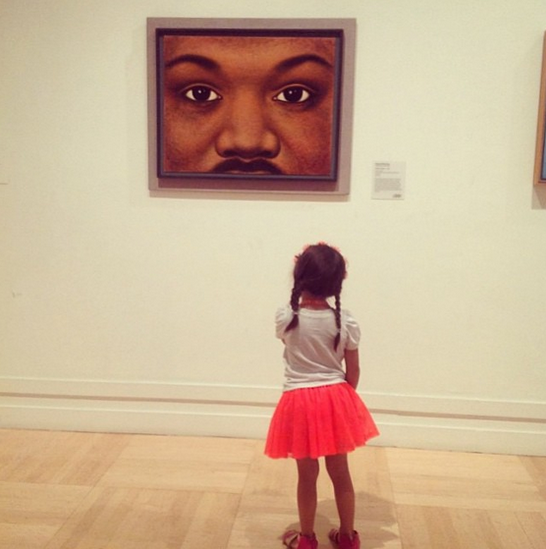 As part of its Free Holiday Monday program, sponsored by Target, the museum invites families to come by and check out its exhibits, particularly the newly opened exhibition "Faces of America: LACMA Collects," featuring the above painting of the late MLK Jr. by Edward Biberman. Parents can even get timed tickets for their kiddos to visit the Boone Children's Gallery. The timed tickets are for 30 minutes and are available on a first-come, first-served basis. LACMA is open today from 11 a.m.-5 p.m. It's time for Agents Otto and Olive to save the world, and kids are going to love it! On Monday, January 19, be sure to tune in to "Odd Squad" on PBS Kids for a special event from the math-tastic show. "Odd Squad Saves the World" will feature an hour-long episode with four different stories. The special event also kicks off a week of new episodes. "Rise of the Hydraclops" -- In order to save the world, Agents Olive and Otto must find a treasure chest that Otto buried. CC, Will and I were able to catch a sneak peek of the episode, and both of them squealed with delight when they saw the Hydraclops emerging from the ocean. Definitely a fun story line! "Dance Like Nobody's Watching" -- When the alarm system at Headquarters is triggered, Olive, Otto, Ms. O and Oscar must avoid a series of booby traps so that they can turn it off. "Recipe for Disaster" -- Otto and Olive explain to Ms. O how a case went wrong, each in their own way. "O Is Not for Old" -- The "Odd Squad" agents throw a surprise party for Ms. O. Included in our sneak peek package was a couple of Odd Squad T-shirts that are brilliantly designed to look like suits worn by agents. CC couldn't wait to put hers on -- and, of course, I had to tweet it out. 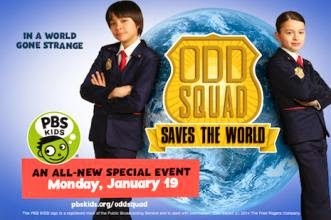 And if you're free on Thursday, January 15 from 10 a.m.-11 a.m. PT, be sure to join the "Odd Squad Saves the World" Twitter party. The show's creators, Tim McKeon and Adam Peltzman, plus series producer Paul Siefken of The Fred Rogers Company will tweet with you about "odd" tips and tricks to save the day for your fam. Use #OddSquadPBS to join the conversation! 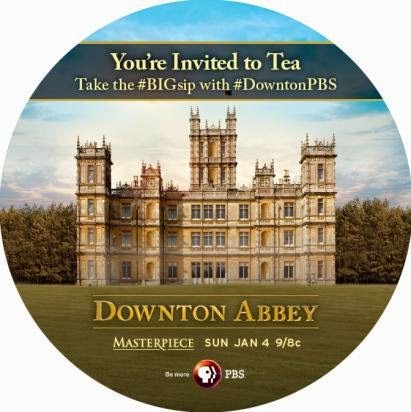 While I'm definitely more of a coffee person, I'll be raising a teacup today in anticipation of the "Downton Abbey" season 5 premiere on Masterpiece on PBS! We left season 4 with Carson and Mrs. Hughes looking out into that great ocean while *gasp* holding hands! 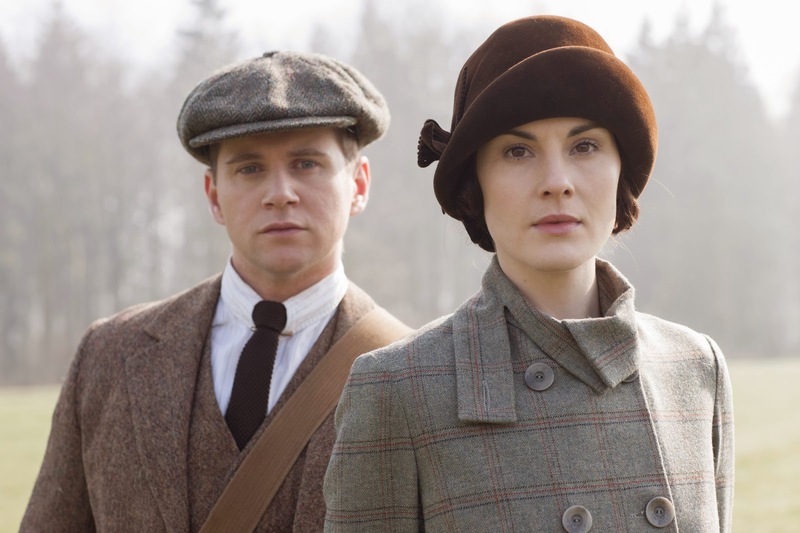 And which man will Lady Mary choose? And where exactly does George Clooney fit into this season? We'll find out on Sunday, January 4 (9 p.m. PT), when season 5 kicks off. It's been way too long! If you need a quick refresher on last season, head over to PBS to "binge watch" before the premiere.